Procedures designed around the latest equipment and scientific advances that are revolutionizing liposuction procedures are responsible for bringing us cutting-edge equipment such as the Zimmer Cryo 5. This laser-based operating system designed by Zimmer Medizin is expanding the potential benefits available to patients who have concluded that this procedure is right for helping them achieve their health-related goals. Zimmer Medizin is able to advance the equipment available to patients all around the globe thanks to its extensive experience in this field and undying commitment towards the needs of their patients. They are a trusted manufacturer whose repeat business has allowed them to become a common name in the industry. They offer wholesale prices, warranties that are all-inclusive, and customer support and service that is second to none. Other products that they have developed with applications in liposuction procedures have gained them wide recognition which includes awards reserved for the latest equipment to come to the market. The Zimmer Cryo 5 stands out among other products of its kind due to the fact that its design has been carefully considered from every angle. The convenience of operations for the doctor, the comfort of the patient, and the effectiveness of the operating system have all been carefully balanced to achieve optimized performance each and every time. The light-weight hose allows for the least strenuous operation possible. Additionally, there is relatively little maintenance that must be performed in order to keep the machine in top condition. This proven technology has earned the Editor’s Choice Award from Aesthetic Trends and Technologies as well. 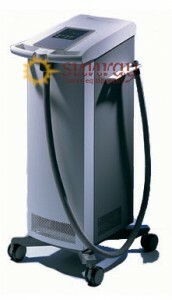 Giving your practice the advantage that the Zimmer Cryo 5 offers only requires ordering your refurbished unit from SunrayLaser.Com. We are experts in the art of reconditioning laser equipment to optimum conditions. Your satisfaction is guaranteed with every purchase and contacting us today would start your way into owning this great piece of equipment.